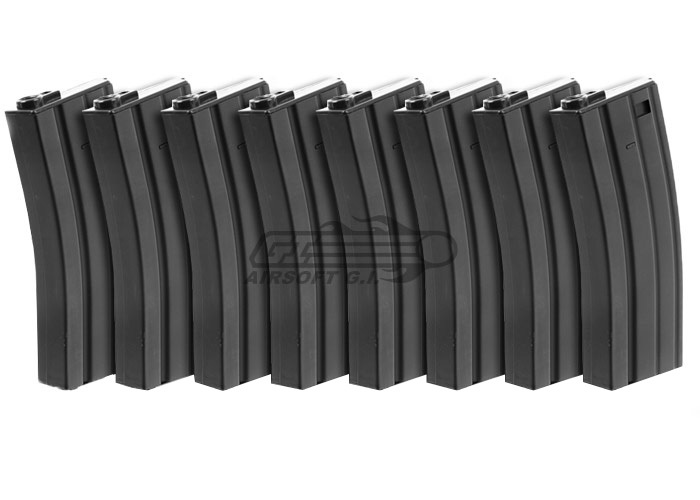 The Echo 1 Dogs of War M4 / M16 magazines are a perfect bundle to add into your collection. Each magazines holds 100 rounds so that you can add some realism to your game play by reloading. Take a couple magazines with you on your next skirmish to have all the ammo you need to keep the battle going. These magazines are made with all metal materials on the shell, which provides a tough exterior that can handle drops and falls. This magazine is recommended for use with the A&K, Echo 1, JG, Tokyo Marui, Classic Army, VFC, ICS, G&G, and G&P M4/M16 series AEGs, it may work with other brands AEG but cannot be guaranteed by Airsoft GI. I didn't actually buy these from GI, I got them from my local field, where they ran for $15 a mag. They are amazing quality, and they fit amazingly in my G&G Combat Machine M4. They are a great investment. Nothing. These are pretty much perfect as far as magazines go. Got these for my Echo 1 Platinum M4, they are the epitome of perfection. They fit better than the mags that came with the gun. Fit perfect. Full metal so have a nice weight and can take major abuse. And have a cool logo on the bottom. None, if your in the market for full metal magazines buy these, they're worth the price! Will these fit a FMG4? will these fit a Krytac SPR? will these fit a G&G GR16 Carbine Light? Yes, these magazines should be compatible. Would these fit in a Dboy mk12 Mod1 SPR AEG? Will these fit in a Lonex M4 (GI custom)? Will this work with a KWA Full Metal M16 Battle Rifle 2GX Airsoft Gun? Will these mags work in a elite force ares m4 cqb?